Yes! Today was very fruitful! I went and saw @claudine.de.montigny and we determined that the laughing moon regency stays fit me right out of the bag. Great! We talked through more stuff, I drooled over her fabric and parasol collections, and then headed home. 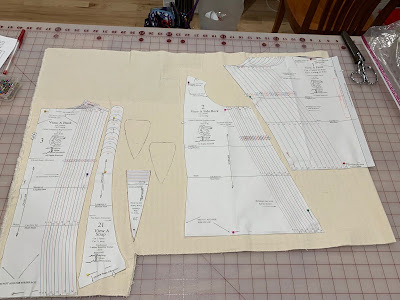 I had some other things to take care of, but eventually worked my way into my sewing room where I managed to shorten and wash a petticoat that has needed that to happen for about 5 years now. Rad. Then I measured out some coutile, washed it and cut and finished the edges for that layer of the regency corded corset. There was somehow much ironing in there, aaaand I listened to Hamilton whole all that was happening. I managed to figure out what I was missing for most of these projects, and I ordered a bunch of supplies that I will need, and generally figured out a bunch of admin sort of things that need to get done for these projects to move along smoothly as well. That part always takes Kyoko more time than I anticipate. I feel like I got more done than I expected, so that’s awesome. Tomorrow is largely taken up with a bunch of social obligations, so I don’t know how much I’ll get done, but I may be able to work on some small stuff. I am keeping track of my hours on all of these projects so I know approximately how long it takes me to do stuff in the future. I’ll report back on what those numbers are. I’m pretty slow, largely because I don’t cut corners. I iron at every step, I pin things, I read the directions twice, sometimes more. So, I don’t have any real expectation of How long everything will take, but it’s good to track.